Its the 4 Ts.... and Mollie! Ah, Colin..... what can we say in a short paragraph! 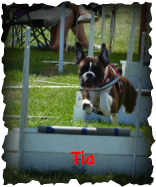 Colin has been in flyball since 1906 and currently runs the highest scoring Boxer in flyball history - Tia. Colin is married to Bev and they share everything in life... hence, you'll often see Colin in very short waterproof pants and Bev in very long ones..... When not racing he can be found behind his trusty video camera, or helping someone put up their awning! However, if anything goes wrong...it's Bev's fault! Bev started flyball in... Poor Bev has a hard time of it at flyball events. Not only does she have to spend the weekend with Colin (she's married to him, so no choice there.....) but she also runs two of the most manic dogs in the BFA! 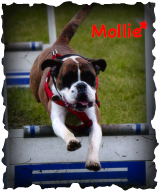 It all pays off though, as Mollie is the fastest boxer in flyball! Bev won the game of cards with Colin many moons back which meant she got to choose Boxers rather than GSDs. Flyball debute - 2003 Market Harborough. Trudi likes obedience and has passed all of the Good Citizen awards from bronze up to gold. Trudi started flyball in 2002 and has competed in the Fylde Surfers team and the Fylde Go4's Multibreed team and won a variety of rosettes. Trudi is known as a big flirt by the rest on the team, especially with Emerys her boyfriend! Trudi has her FD 200 points flyball award. 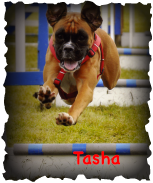 At Angelsey in July 2007 Trudi became the first Boxer to obtain Flyball Dog Intermediate, something we thought she would never achieve. .
Hello, I’m Tasha. When my mum and dad first came to meet me, dad for some reason wasn’t too keen on me. It may have been because at the time I was messing about in the curtains. After going home and laughing about me, they changed their minds and came back for me. Lucky them! At first I would not leave the house to go for a walk, now they can’t stop me. I do tend to be a bit wary of other people and dogs and may bark at them but dad now takes me to obedience classes where I am getting used to other dogs and people and I have now passed my Kennel Club Good Citizen Bronze. 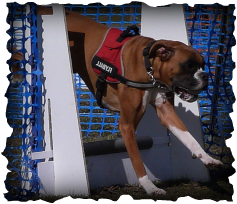 I have tried this game called flyball but at the moment I am finding it more fun jumping out over the netting and at times running down both lanes. However, I am sure that when I get my head out from up my a**, I will get the hang of it. 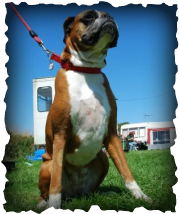 Tia lived with Bev and Colin and their 4 other boxers. Tia was the 5th girl in the household, making Colin very out numbered! Tia was a lively, friendly and out going little dog who loved nohing better than having cuddles and terrorizing the other 4 girls. Tia excelled in dog obedience and before the age of 2 has passed the Kennel Club Good Citizen Bronze, Silver and Gold levels. In 2008 she came out of starters in flyball and took part in the sanctioned racing where she obtained flyball dog status on 30th August 2008 at Ryecroft Farm. Tia also gained her FDI,FDG and is the first boxer to gain her FDA, Silver, Gold, Ice Blue Moon and platinum awards. She remains the top Boxer on the BFA and the only boxer to gain the Platinum Award.